Rotary District 6440 and the Pan American Health Organization (PAHO) jointly have pre-published on the Internet a diagnostic imaging reference manual “Diagnostic Imaging in the Community- A Manual for Clinics and Small Hospitals.” The manual is authored by Dr. Philip E.S. Palmer and Dr. Gerald Hanson who are internationally recognized for their work with PAHO and WHO (World Health Organization) in radiology and radiologic safety. They have given pre-publication rights to Rotary District 6440 and PAHO to assure immediate availability of the information for the Guatemalan project organized by Rotary District 6440 in Northern Illinois, Rotary District 4250 Guatemalan clubs, the Guatemalan Minister of Health (MOH) and PAHO, and to beta test the content before eventual publication by PAHO. “Diagnostic Imaging in the Community- A Manual for Clinics and Small Hospitals” is edited by Dr. Janice Honeyman-Buck, editor of the “Journal of Digital Imaging” who has contributed to the digital section of the manual. The manual has sections on site selection and survey, radiation safety, site preparation, film processing, digital alternatives and ultrasound. The manual includes general X-ray systems with a focus on the digital World Health Imaging System for Radiology (WHIS-RAD) an international standard supported by PAHO and WHO. 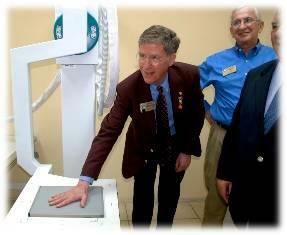 The pilot site in Guatemala City is a digital WHIS-RAD that employs Computed Radiography (CR) for digital processing. The Guatemalan project envisions a multisite system similar to the pilot site and will provide a base of experience for similar installations in Latin America and around the world.